Of all the bugs in Thailand, I have to say this one “creeps me out” the most, this giant centipede (see pictures below) has quite a fearsome reputation in Thailand. It is said that a bite from this monster centipede is excruciatingly painful, even more so than a snake bite. Red for danger: Thailand’s Giant Centipedes are red, and dangerous. Click here for a larger view. 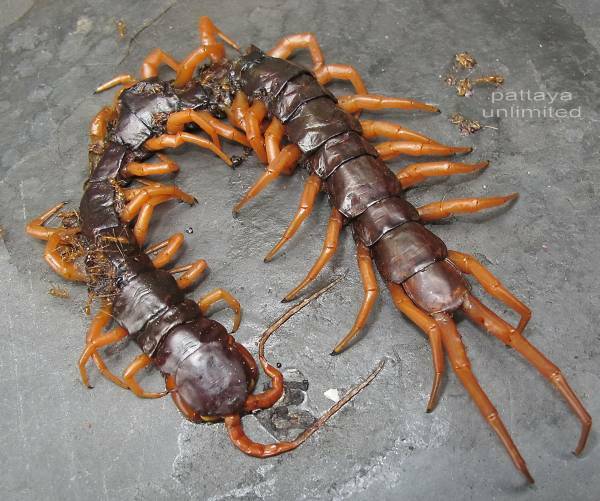 I believe the correct name for this centipede is “Vietnamese Centipede” (Scolopendra subspinipes) it is found in tropical and sub tropical regions throughout the world, it can reach lengths of 10 – 12 inches and can live for 10 years. I estimate the one in these 3 photos is between 7 and 8 inches long. These giant centipedes have a fearsome reputation in Thailand. 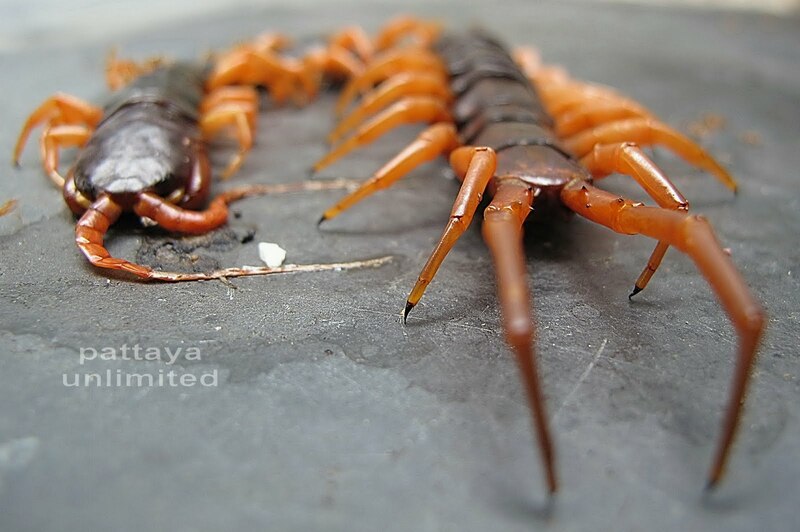 It’s only the second time I have seen one these monster centipedes in Pattaya, fortunately they were both dead, the one in the above photo looks like someone bashed it with a stick. 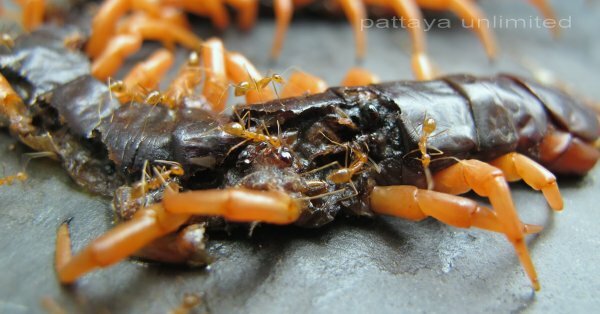 If you happen to come across one of these centipedes in Thailand, treat it with caution, if you aggravate them they will bite, they have specially adapted front legs which act as pincers, they use these to catch their prey and then inject it with venom to kill it. The centipede will use these same pincer like legs to bite you. Thailand’s poisonous centipede. Click here for a larger view. I believe the correct name for this centipede is “Vietnamese Centipede” (Scolopendra subspinipes)it is found in tropical and sub tropical regions throughout the world, it can reach lengths of 10 – 12 inches and can live for 10 years. I estimate the one in these 3 photos is between 7 and 8 inches long. Ants feeding on a dead Giant Centipede. 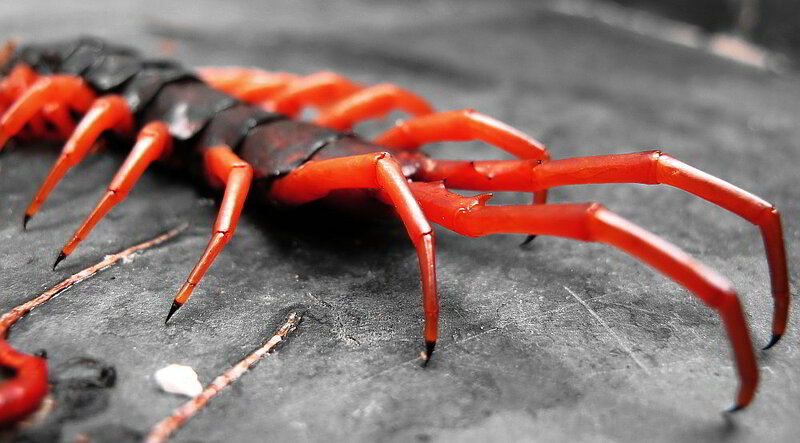 These giant centipedes are also known as “Chinese Red Headed Centipedes” and Asian Forest Centipedes”. You may find them underneath rocks, tree logs, damp foliage or partially buried in loose damp soil, they have also been known to shelter inside shoes. A bite from one of these centipedes is extremely painful, the pain can last for 4 or 5 days. Severe swelling and bruising often results from being bitten, some people may suffer more adverse effects such as breathing difficulties and a rapid heartbeat. Children are especially at risk and should be taken to hospital if bitten by one of these centipedes, probably a good idea to see a Doctor anyway if you get bitten. There are some remarkable videos of this centipede on youtube, the one below shows how large and fast the centipede can be. You can also view videos of the centipede vs scorpion, centipede vs snake, and the centipede in battle against various other creatures.